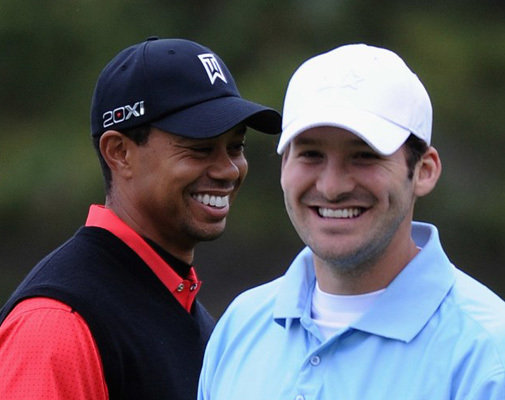 The incredibly charmed Tony Romo is enjoying a life any sports fan would envy. His hot streak since retiring as the Dallas Cowboy QB includes killing it as the CBS #1 NFL analyst and plays golf as often as he desires. Which is a lot including regular attempts in U.S. Open qualifiers and a smattering of Tour events. Among his golf buddies is Jordan Spieth and Tiger Woods. He and Jordan regularly play at Dallas National when both are in town. The other benefit? Using the hand-me-downs from Spieth and Woods–which he’ll use this week at the AT&T Pebble Beach ProAm. Golfdigest’s Alex Myers with the report. The accomplished celebrity golfer has a couple hand-me-down clubs in his golf bag. Of course, they’re not exactly what you’d find in a discount bin at a sporting goods store. PGATour.com’s Andrew Tursky did a deep dive into Romo’s golf equipment on Tuesday and while gear geeks will be more interested to know what type of shaft the 38-year-old has in his fairway woods, the real attention getters are a 60-degree Vokey wedge he got from Jordan Spieth and a Nike Method putter inherited from Tiger Woods. Charmed life? You bet. But, I’m curious if would’ve traded all this wonderfulness for a Super Bowl win?